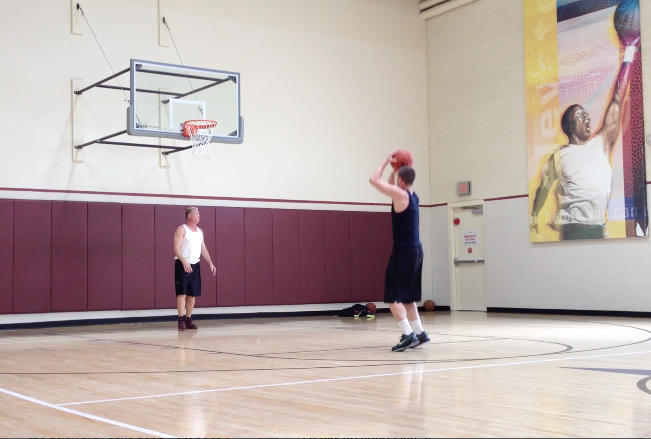 Take a look at this video I took of a father and son practicing basketball in our gym. In this clip, the young man doesn’t miss once. It’s impressive. It is also the result of deliberate practice. Let me explain, deliberate practice isn’t just putting in time. It is focused activity on honing a skill set until it becomes second nature. In this kind of training, the individual job is broken down into smaller and smaller parts and rehearsed out of order. The purpose is to master each part. As an example, the first time I saw the young man in the video practicing, he was wearing big bulky leather gloves while dribbling two basketballs in and around his legs. I had never seen this kind of specific drill; however, I instantly recognized the philosophy. With gloves still on, his next exercise was to dribble two basketballs against the wall at head level. Then, as a variation from his standing position of dribbling against the wall, he brought one knee to the floor and then the other. Deliberate practice is applicable to anything you want to create. It offers tangible; spiritual, emotional, energetic and physical improvement. By mixing up all the little pieces there is conscious intent in putting complete attention to mastering each tiny segment. This “process style” of practice brings emphasis to the flow instead of the final result. For example, let’s say you wanted to use deliberate practice to become healthier and more energized. There would be several pieces that could be indentified for you to practice. Some of these parts would include: goals, plans, attitude, emotional feelings, visualization, meditation, sleep, exercise, and food. In using deliberate practice to highlight your emotional feelings, you would write in a daily journal every time you eat. This journal could be used to capture your feelings before, during and after each meal. Specifically, thoughts such as; “I feel angry that I’m so hungry”, “I’m mad there’s nothing to eat.”, “I’m not happy eating alone.” Or, “It was fun eating dinner with my date.” This journal will quickly reveal patterns where deliberate practice can be used in connecting good emotions with food. In summary of using deliberate practice for better health, imagine eating consciously. How does your body respond to your chewing, each bite, upwards of six times or more? After lunch, do you have more energy or less? What kind of atmosphere surrounds you as you eat? What are your thoughts while eating? Deliberate practice is used to master a process and can be used for anything. It takes care of the end result. Once all the individual pieces of the flow are reconnected linearly, the outcome is mastered. It’s impressive. But it is also the result of deliberate practice.